I’ve been getting a bunch of surveys recently, more than usual for some reason. It seems like each time I contact a company or buy something where I’ve given my email address they want me to take “less than 10 minutes” to complete a survey. In the past few weeks, I’ve been interrupted by big brands that should know better like Skype, Apple, Nike, and AT&T. At AT&T, we value your opinion. We strive to give you the best service possible and that can't happen without your honest feedback. Every voice matters – especially yours! By taking less than 10 minutes to complete a brief online survey, you have the opportunity to make your voice heard.We are specifically interested in talking to you about your recent experiences with AT&T. Just click below and help us improve in order to serve you better! How do the marketers let this happen? It is crazy for a company to take from people at a critical moment – when they have just sat on a customer support call or when they have just purchased a product. Rather than taking, companies should be giving. Specifically, they should be delivering valuable content. What a stupid statement. It’s not “we value your opinion” but rather “we want to take some of your time”. It seems to me the problem with these surveys is the survey people (those in customer support who are measured on the satisfaction of people on a transactional basis for each telephone support call or product purchase) aren’t at all connected to the marketers who are responsible for educating consumers. And the senior executives are so focused on spreadsheets that they can't even comprehend that the process of gathering that customer service data is actually hurting the company. They must know that the metrics are based on people who have nothing better to do but fill out stupid surveys. Don’t they realize this obsession on the leaves on the trees means they miss the trees, let alone the forest? Each time you email a customer you should be providing content of value. You should always be giving more than you are taking in a relationship with a customer. I would just do away with this kind of survey completely. But if companies must do it, why not offer something of value first? Why not have a video link showing how people use the product I just purchased? Then ask for opinions. Why not link to the company blog that talks about common customer issues that can easily be solved? Then ask for opinions. Why not link to the online forums for the service that I just signed up for? Then ask for opinions. Why not tell me, in writing, the answer to the service question you just told me over the phone? Then ask for opinions. I’d love to have some examples of companies that are actually doing what I suggest. I have yet to find any. 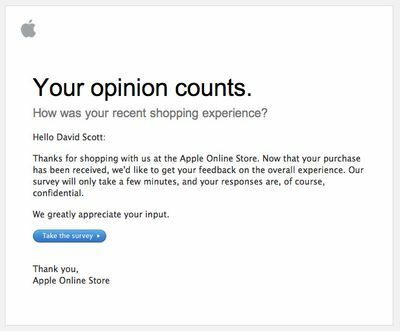 Does your company or any companies you do business with educate and inform consumers first and then ask for a survey to be completed (in the same email)? I’d really like to have some sample emails.